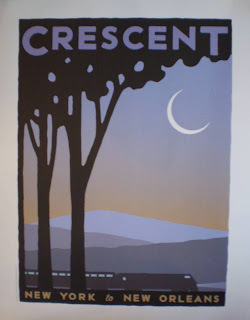 Laura and I are headed up to New York Saturday night on Amtrak's Crescent. We decided to add a little travel adventure to this year's Westminster trip. While I'm sorry all of our friends in Va and DC are suffering through "snomageddon" we were also sweating out whether we would be able to make the trip. But it looks like the trains are running close to on time again. We leave around 8:30 Saturday night from Atlanta, arriving early afternoon Sunday at Penn Station, which is under Madison Square Garden and just across the street from the Hotel Pennsylvania. 16 Cardigans (10-6) show at 9:15 Monday morning after 21 pems under Judge Klaus Anselm. Last year several folks said they enjoyed reading the ringside twittering and blogging, so I will attempt to repeat this year. Have a wonderful time -- and GO SCOUT!!! Grace will be cheering Scout on as we all will. Good Luck and have fun. Sounds like a good time! Best Wishes for Scout! Best wishes to my favorite red-head. I will be looking forward to your twitters. Good luck to Scout and good luck to you all in the Southern snow. It's been a winter to remember-and we're got 5 more weeks left! What fun! Have an excellent trip! Have fun Janet and Laura and Good Luck Scout.